This is such a great shot from the Open Championship. 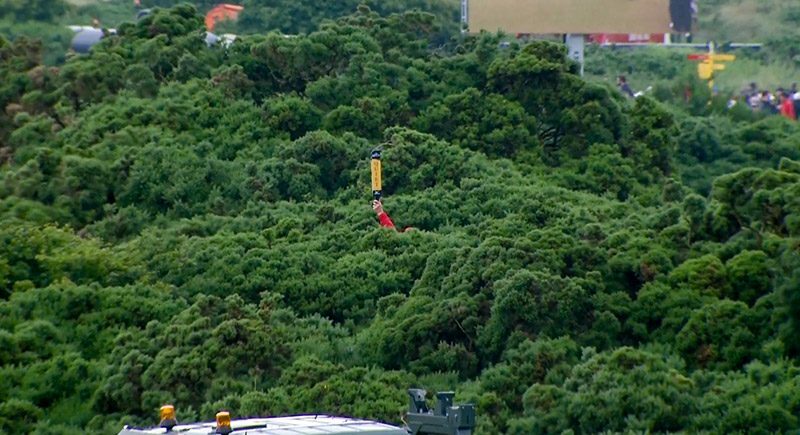 Somewhere in the gorse is Padraig Harrington. This morning I had fun doing an appearance on CBS Sports Talk Radio 1700 The Champ on the Jimmy B & TC Show. 1700 The Champ is based in Des Moines, Iowa. Our subject of discussion was the Open Championship and the win by Iowa native Zach Johnson. Obviously they’re super stoked about that. It was fun to talk golf over my morning coffee with Jimmy B and TC (Jim Brinson and Trent Condon). When the podcast of today’s show becomes available I’ll post a link to it. This was the second appearance I made on the show. Last week we did an Open Championship preview which went quite well. Tooting my own horn (beep beep), I have to mention that in the preview for the Open I expressed my doubt that Tiger Woods and Bubba Watson would make the cut in the Open. They did not. A broken clock is right twice a day, assuming it isn’t a military clock. Here’s a link to the podcast of the Open preview show. Thanks to my new pals Jimmy B and TC for the opportunity. We will be doing the same gig before and after the PGA Championship at Whistling Straits. Now the golf course begins. This magnificent par four plays as the second most difficult hole on the course after the 17th Road Hole not only during the Championship but also day to day. I’m not nuts enough to get up at 2:00 a.m. my time to watch the Open Championship. That’s what DVR’s are for. Speaking of DVR’s, here’s your DVR list of Open Championship TV times below. This list is for me as much as it is for you! Welcome to Open Championship week. Having played the Old Course several times now, I have a soft spot in my heart for any cool photos, blog posts, or video from there. The St. Andrews Links Trust keeps a blog which is one of the few golf blogs I frequent. I love seeing their updates. Today’s was fantastic, a time lapse video of the rebuild of the very daunting “Hell Bunker.” I’ve been in that bunker, once. The riveting (the laying of sod layers to create the steep walls of the bunker) is tedious and expensive in terms of labor and money. No courses I know of in the USA do this kind of bunker work. It is very cool. Hats off to the St. Andrews Links trust for such a neat video.